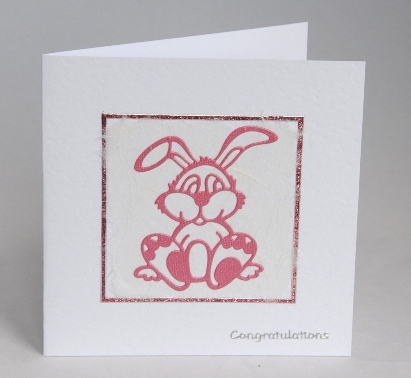 This cute pink bunny brings congratulations and a warm welcome to a new baby girl. The bunny sits on a square of white mulberry paper which is framed by co-ordinating pink glittery lines. Congratulations is written in silver below the square and the card is blank inside for you to write your own message of welcome. The design is also available in blue for a boy – please let me know which colour you want at the checkout. If ordering by phone, please reference card #550.